Yesterday, we left Saskatoon around 940am and despite a delay due to snow in Calgary, Air Canada had us in Honolulu right on time at 6:15pm local time. It was a lovely evening in Honolulu, 28 degrees with a light breeze. Our group (of about 42), checked into the Outrigger Reef on the Beach. I couldn’t see much of the grounds as it was dark, but the staff was friendly and our room is nice and newly redone. It’s a lot of dark woods and modern design. We have a corner room, so two balconies – one overlooking the beach and ocean and the other looking at the new Trump Towers, accross the street. We can hear a little bit of noise from the street, but we’re on the 14th floor, so it’s not bad at all. After checking in, we met up with the group for a cocktail and some appetizers and got reaquainted with some people that we have’t seen for a while, then we walked to Jimmy Buffet’s Margaritaville for a dinner that was nicely sponsored by one of our suppliers. By this time, it was almost 9pm local (1 am at home) and it was, truthfully, feeling more like bed time than dinner time. However, the food was good and there was a band playing. We made it till about 11pm, then it was definitely time for bed. As we had walked to the restaurant as a group, I had paid absolutely no attention to where we were going. If I had been left to get home I my own, I would still be out there, wandering around! Thankfully, Mark has better observation skills and let several of us safely back to the hotel. After our meeting this morning, it will be a free day for everyone to catch up on sleep, take in a bit of Honolulu and visit around the pool 🙂 We are thinking of doing a sunset dinner cruise this evening. It looks like it rained overnight, but the forcast for today and tomorrow looks good – mainly sun! Tomorrow we have a VERY early start – around 6am pickup at the hotel for our tour of the Pearl Harbour sites. Well this will be my last blog from Maui as we are off to Honolulu today. 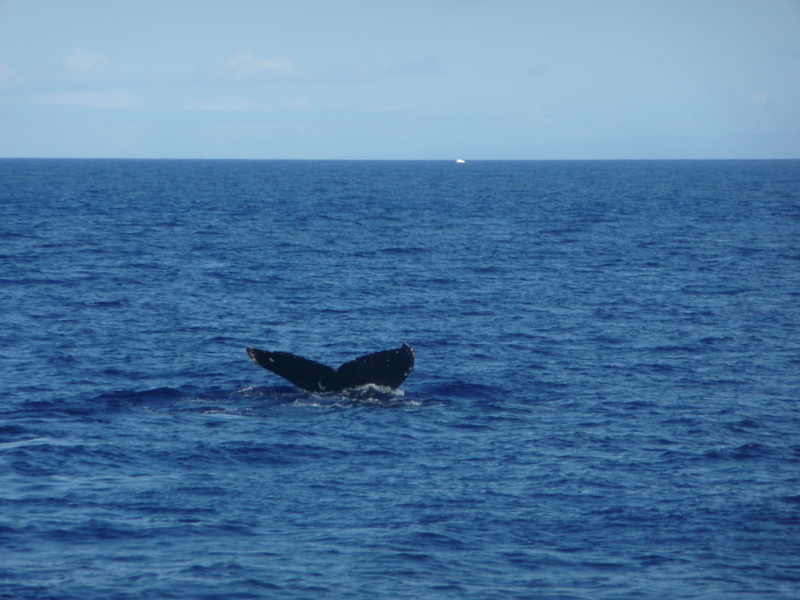 Yesterday we were up early to go on a whale watching tour from Lahaina. We went with the Lahaina Cruise Company for a 2 hour cruise. It wasn’t long before we seen a baby (if you can call it that. 15 feet long and 1500 pounds) and we knew that Mom could not be far off. After about 10 minutes Mom surfaced and it was really something to see both of the swimming together. Mom was huge as you could see her just beneath the water. The boat does not come up really close to the whales but you really don’t have to to see the size of them. It was really nice to be out on the water and look back at Maui. The mountains are really something to see. After the cruise, we went to the Pioneer Inn across from the harbour for breakfast. After a little shopping in Lahaina, we came back to the condo and spent our last day on the beach before going to Honolulu. While we were on the beach, we spotted a big male humpback who was out playing in the water. It was unbelievab le. He was rolling so his pectoral fins were coming right out to the water and then he we poke his head out almost to see if anyone was watching and then would do it again. It was something to see. We had binoculars so we could see him up close. It was a WOW. We went to Dollys across the street for supper and then came home to pack. 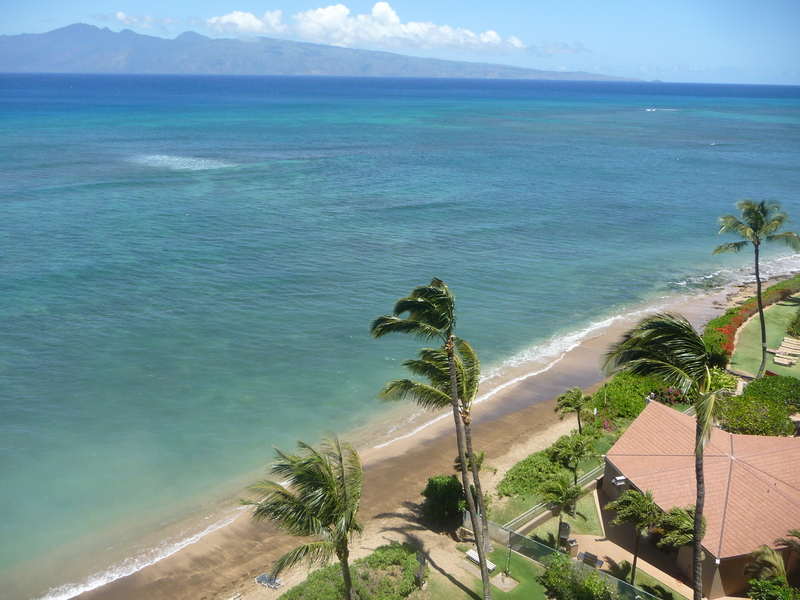 We really enjoyed out stay in Maui and sitting on the lanai looking over the ocean. What I am going to miss most is the sound of the waves lulling you to sleep everynight. Aloha from Maui. Here is a picture off our lanai. Our flights to Maui went very smoothly and we arrived 45 minutes early. We picked up our car and made the 1 hour trip to our condo in Kahana. It is a nice drive along the coast. We are staying at the Valley Isles Resort. We dropped our stuff off and went to Dolly’s Bar and Grill across the street and then home to bed. We are up very early so we decided to take a walk on the beach. We saw whales and a sea turtle all before 7:00am. The beach in front of our hotel is not the best but we can just move next door. It was about 28 today and very windy. After a day on the beach, we headed into Lahina for supper. Lahina is a very nice town with some great shopping. We walked for about 1 hour and then headed off to “Cheeseburger in Paradise” which has the best burgers. We were able to get seats over the water upstairs and we watched the sunset. It was beautiful and I am always amazed at how quick the sun goes down. After supper we went to Safeway and bought some groceries. We even gave them our phone number to get our club card savings. A bit crazy. This is our last day at sea before returning to San Diego. We woke up this morning and it was cool and overcast. Once again we had breakfast in bed for the last time L and then we had to be at the Vista Lounge for the dise mbarkation information speech. This afternoon we are having a culinary demonstration and then are meeting for a cocktail party in the Crow’s Nest from 6:30-7:30. After that we are meeting for our last dinner together in the main dining room. We have to have our bags outside our door by 1:00am to be ready for our disembarkation tomorrow morning. Tomorrow morning we have to be in the Vista Lounge at 6:45 to go through customs. We have our disembarkation scheduled for 9:00 am and then our flight home is 14:30 on Delta. We have a connection via Minneapolis and arrive into Saskatoon at 22:55. Well that is the end of our voyage! We will both be back into our offices Monday morning, so if you are interested in a Holland America cruise please let either of us (Correna or Adrienne) know! We woke up in Los Cabos this morning. This is a tender port where we the life boats into the marina, we had to head down to the Queens lounge to pick up our tender ticket and then wait for our number to be called. We would compare Los Cabos to Cancun with lots of shops, restaurants and bars. We both thought of Cabo in different ways, Adrienne liked the new and clean Mexico where Correna didn’t think it felt like Mexico but instead felt more like you were in the United States. We walked around the Marina area and did a bit of shopping. We did happen to fall into a restaurant that was serving 2 for 1 Margaritas and had a bite to eat. When we got back on the ship we could see the two RIU properties from our veranda. Tonight was the last of our formal evenings. We had the surf and turf for dinner and then went to the Lido for the chocolate extravaganza for desert. Before desert we did stop at the Vista Lounge and watched the magician. This morning Correna was up before the alarm clock, you would think we might be in her favorite destination or something? Once again we had breakfast in bed, got dressed then went down to Deck A to depart the ship. The ship is docked right across from a huge Wal-Mart and new shopping center. This is also a major bus terminal for Riviera Nayarit. We walked a couple of blocks down found a little convenience store that sold water and right outside was a bus stop (when you are leaving the ship they were charging $7.00 for a bottle of water). We then got on a local bus heading to Centro and rode it to the Malecon. Along the way we passed the Puerto Vallarta hotel zone and watched for our favorite resorts. When we got to the Malecon there were many guided tours milling around. We had beaten them there and we were on our way by the time they figured out what they were doing. It helps to have someone who has been to Puerto Vallarta many times. We stopped and had lunch at a street side restaurant called Andales, we started the walk back and saw the cathedral (we couldn’t go in because they were having mass and earlier in the morning there was a funeral so we didn’t get any pictures). We got on a bus and headed back to the ship, we got off at Wal-Mart and bought adult beverages and tobacco. You can bring wine and champagne in your room but hard alcohol is held in storage until the end of the cruise.